The ProRower H2O RX-850 LTD Series rowing machine features the innovative Hydro-Power drive system for optimum performance and a pleasurable workout experience. The oversized LCD window on the display panel shows time, distance, 500-meter split time, strokes per minute, calories, and heart rate. Frame Length/(Seat) Height: 84" x 22"
UPDATE: The RX-850 model is no longer available. Check out the RX-750 and RX-950 on sale now. 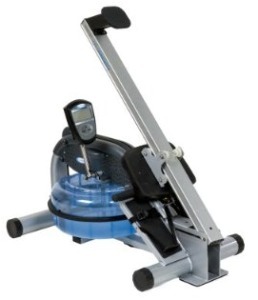 The light commercial ProRower H2O RX-850 LTD Series rowing machine features a polycarbonate water tank and internal paddle system to deliver the sound and feel of rowing an actual boat. There are no adjustments to make or dials to spin to increase intensity; simply row faster. That’s how you do it in a scull and it should be no different when rowing indoors. The enclosed tank holds between 2.5 – 4.5 gallons of water, with more water offering even more resistance. With Hydro-Power, you get a smooth pulling stroke plus the soothing sound of water lapping inside the water tank. The single aluminum rail supports a user up to 450 lbs. 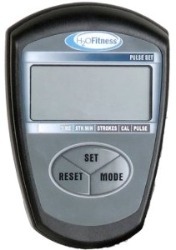 The computer comes with a built-in heart rate receiver so you can add your own chest strap to monitor your heart rate during the workout. Other features of the ProRower H2O RX-850 LTD Series include an ergo-fit seat, adjustable and pivoting footrests, and a lightweight frame that can be tilted vertically for out-of-the-way upright storage. A protective shroud covers the drive mechanism to keep out dirt and dust, thus eliminating the need for maintenance. You simply need to change the water periodically if the water gets cloudy (the rower’s kit includes chlorine tablets and a pump). These water rowers provide a gentle whoosh sound when rowing which is one advantage over the more mechanical sounding Concept2. The ProRower H2O RX-850 LTD Series rowing machine has a smooth, quiet operation for a low-impact aerobic workout that is highly effective for body conditioning and weight loss. The reviews are excellent on this model which is longer for taller users yet is versatile enough to be used by everyone in the house. At just $899, The RX-850 should be on your short list when it comes time to invest in a rower.